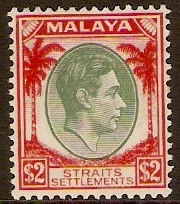 Home :: Malaysia and Malaya States :: Straits Settlements :: Straits Settlements 1937 $2 Green and scarlet. SG291. Mounted mint 1937 $2 Green and scarlet. SG291. Die I. King George VI definitive stamp.